I’ve tried to stay out of the Cameron Newton buzz lately. Really, I tried. Yet, I couldn’t help it any more. I had to weigh in. I’ve just spent the last two hours going over Thayer Evans latest article for Fox Sports. “He knew that he was facing a bad outcome,” the source said. Whenever I read a story and a source is quoted, I look for those simple little marks. It tells me, the reader, that this is exactly what the source said. Anything else can be attributed, but it’s really up to the discretion of the author. The article also contained allegations by Adams that she had received various offers to induce her son to go to Texas, although it made clear that she did not believe that anyone associated with the university was responsible for any misconduct. Nick Voinis, a spokesman for the University of Texas athletics department, complained to me that Evans did not call the university for comment before the article was published. Evans said that if anyone at Texas had spoken to him, it would have violated N.C.A.A. recruiting rules. He should have given them the chance anyway. As in the other cases, a phone call could have headed off much embarrassment. Last month, because reporters and editors in three different parts of the paper did not take enough pains to verify information, The Times reported as fact a political telephone call that didn't happen, fell victim to a faked letter to the editor, and published a sensational anecdote about a college football recruiting battle that the paper cannot be confident is true. Each failure had its unique causes, but all show how, in a business that relies heavily on trust, it is imperative to stay vigilant and skeptical. This is worse than a two-source/one-sided article... it's a one-source/one-sided article. Which is exactly what Evans has done again. Back to the current piece. Evans alleges, and is corroborated by his source, that while at Florida, Newton violated the University Honor Code on 3 separate occasions (in all honesty it could have been 4 occasions, 4 are listed, but Evans makes it unsure which 3 he’s referring too). He first violated Florida’s student honor code by cheating in a class during his freshman year, according to the source. If a faculty member believes that a student has violated the Student Honor Code, the faculty member should talk to the student with his/her suspicions and listen to the student's account of the incident. The student and faculty member may have a support person or observer attend this meeting. Once the student is told of a possible academic honesty violation, he/she is not allowed to drop that class. If the student and faculty member reach an agreement to accepting responsibility, 1) the grade penalty to be imposed (reduced or failing grade for assignment or course) and 2) educational sanction. Either way, if this was actually brought up then there should be documentation to support it. It would reside at 202 Peabody Hall. He again violated the university’s honor code by putting his name on another student’s paper and turning it in, according to the source. Newton was caught after the instructor asked the real author of the paper why he had not turned in his work, the source said. According to the source, after the student said he had turned in a paper, he and the instructor went through all the submissions and discovered that Newton had put his name on the paper in question (2). Newton subsequently turned in a second paper to the instructor (3), but it was later found to have been purchased off the Internet, according to the source. The (2) and (3) are mine and used as reference. Here is where I start to have issues with the story. First, the source is not the student involved in the paper dispute. I can say this with reasonable certainty. The “source” here would have had to have seen, with their own eyes, Cam cheating his freshman year, then by chance, would have been in the same class and have been present when the teacher and student making the allegations went through the papers. Second, what kind of class was this at Florida? The paper trail starts to get a little ruffled. We know the paper in question was a typed written paper. How? Because Newton is being accused of purchasing the paper from the internet. But what I don’t understand is, are there two papers involved here? When you first read the quote it makes it sound like Newton didn’t turn in a paper and when he was asked to do so, the paper he turned in was purchased from the internet. But that would poke holes into Offense (2). Even when I was in school, every paper that was turned in required a digital copy. In fact, that’s what schools use to determine plagerism. Florida included. According the School’s website, faculty have access to 4 different plagiarism detection tools (Plagiarism.org; Plagiarized.com; Turnitin, and WCopyFind). Every single one of these services require a digital copy. If they require a digital copy, the how could Offense (2) take place? We’ve already establish that this course is one where papers need a digital copy, because it must have been used to charge offense (3). Even if they don’t require a digital copy, the paper (I would assume) would have be at least type written. If it’s in blue-book (handwritten) that makes it even harder to believe. However, let’s go with the blue book theory. Say the first paper was supposed to be written in a blue book. Then Newton would have had to wait until the papers had been turned in, erased the accuser’s name from the outside of the blue book, write his own name on the outside. Ignoring that the handwriting on the outside wouldn’t match the hand writing on the inside. He would have had to do all this without getting caught. In order to believe this story you’d also have to accept the accusing student completed an entire paper, in class, but failed to but his own name on the blue book. Something that’s normally done the minute you begin writing. All papers must be formatted as follows: 12-point Times New Roman font, 1-inch margins on all sides, and double line-spacing. Your final draft should be polished, stapled, and presented in a professional manner. Students are responsible for maintaining duplicate copies of all work submitted in this course and retaining all returned, graded work until the semester is over. All major assignments must also be submitted via e-mail on the due date. Again, typewritten papers. Not very easily to just slap another person’s name across the front of and claim as your own. Still, that’s the accusation that Evans and his source are making. The source said Newton was to appear for a hearing in front of Florida’s Student Conduct Committee during the spring semester of 2009, but instead transferred to Blinn College. The committee could have levied sanctions against Newton that included suspension and expulsion from the university. The Director or designee shall notify the student in writing whether or not the case will be reassigned, provided that any decision to reassign is subject to the consent of the charged student or student organization. So if Newton was subject to the review, he would still have been notified of the case. Even if he wasn’t enrolled in school anymore. At least that’s my understanding. However, Evans makes a point that Offences (2) and (3) both occurred AFTER the Laptop incident in November 2008. That incident occurred on November 21st, 2008. At that point there were only 12 class days left on the UF academic Calendar. So let’s say hypothetically, and for the sake of argument (however highly unlikely) that Offenses (2) and (3) occurred on back to back class days. I’d say the earliest that puts the charges is on November 25th. That would put Newton’s hearing before the Student Conduct Committee somewhere around February 24th, 2009. That’s technically the “Spring Semester” like Evans says. However, looking at the Florida Academic Calendar, you are putting Offenses (2) and (3) in that first week of December. That’s still an awfully tight (but I’ll admit plausible) window. Students typically face sanctions for academic dishonesty at UF but rarely receive the most serious punishments, according to figures provided by UF's office of student conduct and conflict resolution. Just two of the 607 cases sent to the office from 2007 through earlier this month have resulted in expulsions, and just 18 have resulted in suspensions, those figures show. Suspensions are typically given only to repeat offenders and expulsions for the most serious cases, he said, such as a doctoral student plagiarizing in a dissertation. For other cases, he said, seminars on plagiarism or making ethical decisions are used to help students learn from their mistakes. The most common sanction for academic dishonesty is a grade penalty, such as a failing score, for the assignment. More than 60 percent of cases since 2007 have resulted in that penalty, according to the student conduct office's figures. Students can receive multiple penalties, so those students also might face sanctions such as being required to attend one of the seminars. So the most common punishment by this council is just a grade reduction. But what comes of the grade reductions? Or the penalties for that matter? Students guilty of academic dishonesty carry a notation on their records while attending UF, but offenses other than suspensions are purged from the records once they leave. That’s right. Once the student leaves, nothing happens. It’s expunged. Evans is jumping to a conclusion that Newton was on a one way ticket to expulsion. A road only two people had traveled before at Florida. The biggest question is was Newton ever really facing a Student Conduct Committee? I don’t know. I’m betting Evans doesn’t really know. However, you know who might know? How about all these people, who actually make up the Student Conduct Committee? For faculty, the Term is 2 years. Meaning they would have presided over the time that Newton was alleged to have been coming before the Committee. I’m wonder if Evans tried to get in touch with any of them? I found that list after a 2 minute google search. He’s had days to write this article. That’s not to say an Academic Suspension was out of the Question. Ronnie Wilson, another Florida player, was serving a full-year suspension when he was eventually kicked off the Gators’ team after this third strike. Last month, Newton, and his father, a pastor, told Sports Illustrated that the younger Newton decided to transfer from Florida in early January 2009 when Tim Tebow opted to remain for his senior year, a move that would have forced Newton into back-up status for another season. Newton, however, wasn’t even enrolled at Florida for the spring semester of 2009 when he decided to transfer, according to the source. a few days after Florida beat Oklahoma to win its second national title in three years, Newton was sitting with his father on their living room couch in College Park when the news flashed on the television screen: Tebow was returning to the Gators for his senior season. That was the final piece of information Newton needed—he immediately told his father he wanted to transfer. Cecil said he never found closure from Florida Coach Urban Meyer about his son’s future as a Gator once Mullen left, though he understands the Gators have priorities while fighting for a national title. "Was he No. 2 or No. 3? We never really did define that," Cecil said about Cam’s status in the lineup. "And the verdict is out on whether Tim will stay or go this season." That’s correct and it actually shouldn't matter. I’m actually not even sure what point Evans is trying to make here. There was no need for Newton to be enrolled. The Enrollment date for Spring 2008 at Florida was January 5th. Why is that important? It’s the day Jeremy Fowler has Cecil Newton on record saying Cam would be transferring. Newton wasn’t enrolled at Florida when he decided to transfer, because classes hadn’t even started. The bottom line is very simple. 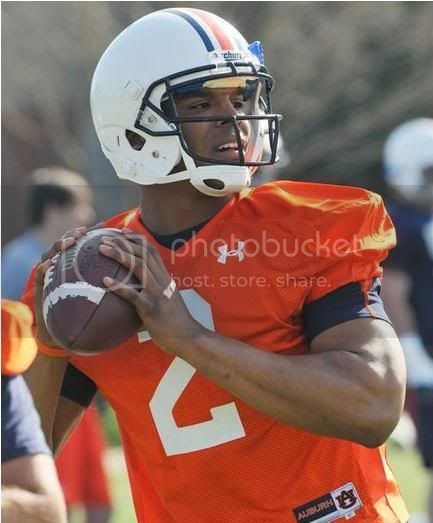 This should in no way affect Newton at Auburn. This was a Florida issue and the lack of prosecution remains at Florida. Newton was clean enough academically to enroll at both Blinn and at Auburn. The Auburn compliance department, one of the most paranoid and by-the-numbers in the country nowadays has signed off on him playing. The only thing that allegations like this do are hurt the character to Cam Newton. Especially coming from Evans. I’d like to know, honestly, what has changed in his attitude towards Newton. Evans has gone from a rah rah supporter to a complete basher. It all started with a tounge-in-cheek tweet that now rings as a man wronged somehow. Evans last three articles have been all Auburn related. Angrily Auburn related. Personally, I don’t see an issue here. I see a journalist with a shotty history when it comes to college sports coverage. It will have to take people picking holes and uncovering actual truth before Newton’s name is finally cleared. Awesome article. You've raised some great issues. I also have read a post elsewhere by a fan about Newton's student privacy rights which were violated by Thayer's publishing such information. In the end, it only serves as a distraction for character assassination and should not be substantive concerning Newton's eligibility at Auburn. I have a child who is a student at Auburn. I am not allowed to see her academic or financial information by law. How did this Evans guy or his "source" get to see Cameron Newton's records at Florida? but honestly, just one look at Thayer Evan's haircut was all i needed to know he's a douche. Excellent assessment of the article, facts and timeline. You should consider submitting your article as a direct rebuttal to the publication that Thayer works for. So...supposedly our friend Thayer is in a Texas hospital today. Hiding? Having a nervous breakdown brought on by guilt? High blood pressure? Getting a testosterone injection? What IS HIS PROBLEM? Anyone? I know he supports the Boise St. kid for the Heisman (which should destroy his credibility right there) but why so vitrioloc about AU? Some AU frat. boy steal his woman back in the day? Isn't is possible that the source was on the Student Conduct Committee? 1) Terms on the UF SCC for students are for one year. The source would have no knowledge of the first (or second) alleged incidents. "honor the principles of peer accountability, confidentiality, and objectivity"
Did the Evan's article change? I don't see a reference to the supposed freshman academic dishonesty offense -- the one that was said to have happened prior to the paper copying allegation. "He first violated Florida’s student honor code by cheating in a class during his freshman year, according to the source." kevin0ives: You are absolutely right. Somehow I missed that. Thanks. Great work!! I'd say nervous breakdown caused by heaps of guilt.. Seriously I'm Canadian .. don't really follow NCAA football and came a cross enough article from that jerk to notice a pattern of personal crusade against Cam Newton .. What's is problem anyways ? and how can Fox sports keep publishing reheated Rubish like that EVERY week ?!?!?! ?